We love food and wine, so when we got the opportunity to design an exhibition around them we jumped at the chance. 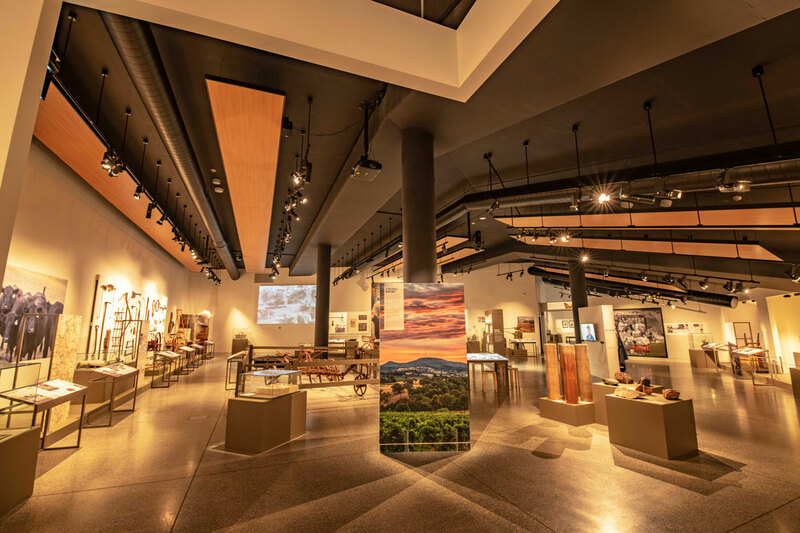 Paddock to Plate at the Orange Regional Museum tells the story of food and wine production in this beautiful district. 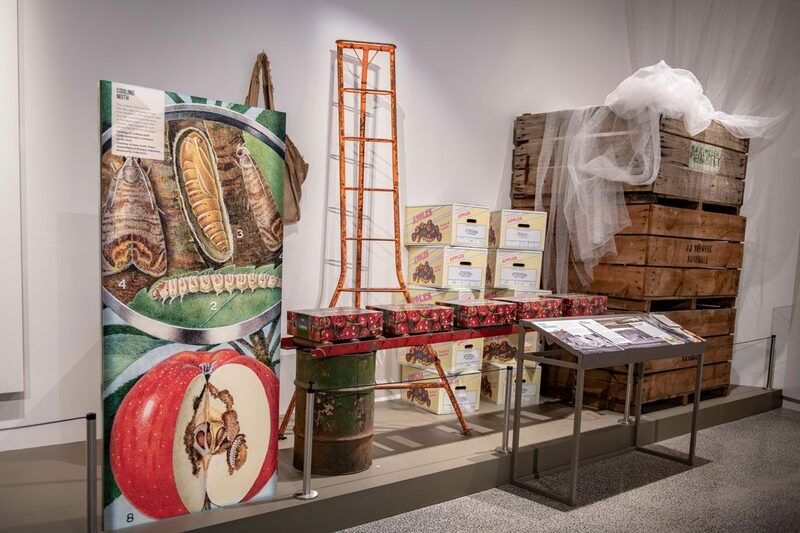 The exhibition is filled with stories of place, people and a passion for produce. 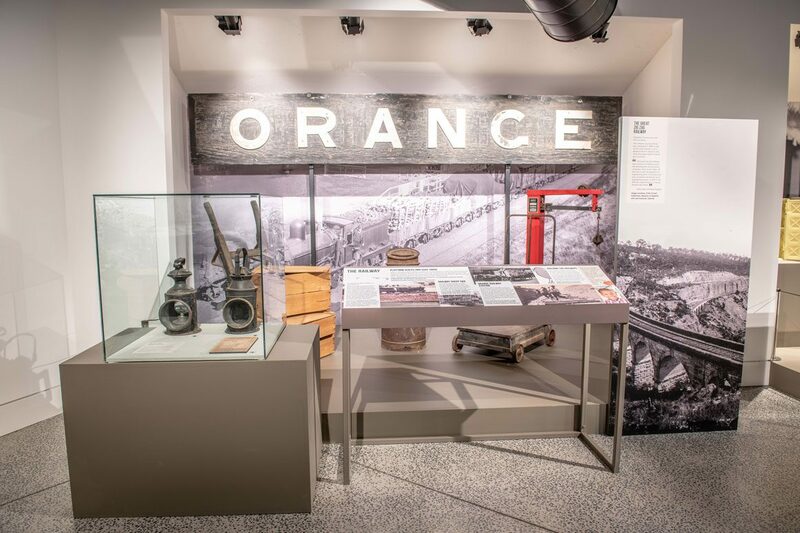 Curator Sandra McEwan and the museum team assembled an impressive trove of over two hundred objects from around the Orange region, with enormous variety in size and scale. Ploughs, refrigerators and a rare wheat flail joined whisks, butter pats and dainty mementos of dining in a bygone era. Working with the size and shape of the museum’s exhibition space was an initial challenge. The irregularly-shaped space has high angled ceilings, twenty-metre-long perimeter walls and a vast central area. We aimed to create pace, interest and an inviting exhibition space. 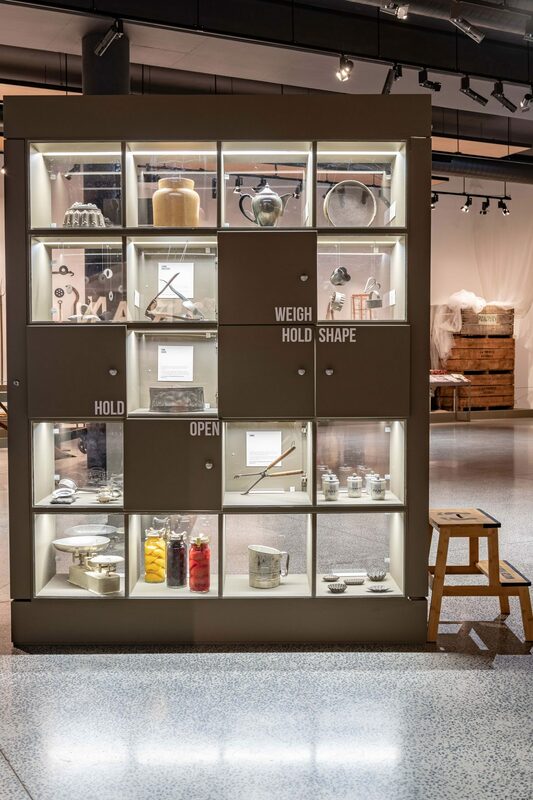 Our concept placed food at home in the centre of the exhibition, with the stories relating to production, processing and external forces encircling it. We activated the central area with two engaging interactives. The first is a stylised ‘kitchen’ displaying utensils in a pigeonhole format that echoes kitchen cupboards. Some of these cupboards are see-through, and others have solid doors. Each door has a single word printed on the face giving a clue to the use of the object inside. Nearby, a dining table is covered in a series of projections showing changing styles and tastes of home eating from the 1800s to today. Stories about producing, processing and forces of change run around the perimeter walls, giving space for large farming objects and showcases containing smaller artefacts. 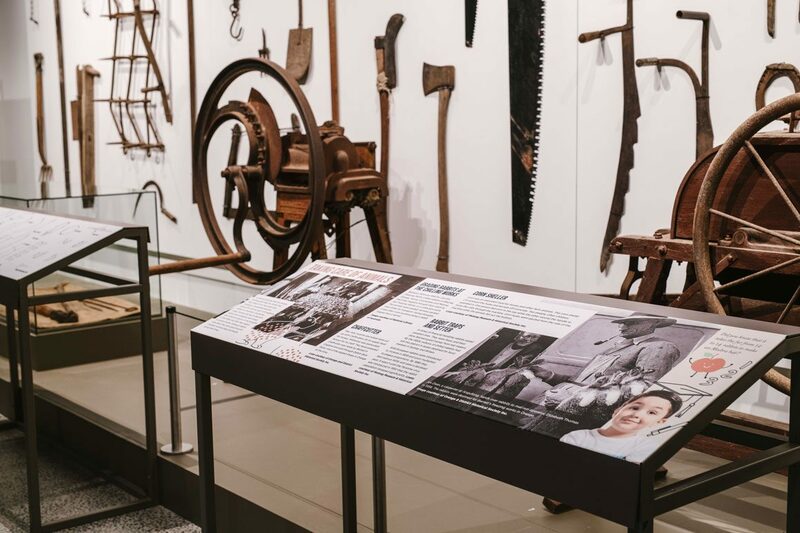 A range of farming tools is mounted on a series of simple white backing boards, so that the timelessly beautiful shapes of these objects can be clearly seen. The wealth of objects and stories needed a simple and elegant background. We used a deep, rich bronzed green for all the plinths and painted the walls in a clean, crisp white. With the addition of striking graphics and illustrations, Paddock to Plate was ready for visitors to feast on.